Dann Gibb at the lower adit, Blue Light Mine, Silverado. Photo by Phil Brigandi. Today I'm posting a bunch of upcoming local history related events you'll want to know about. (May, in particular, is lousy with 'em!) 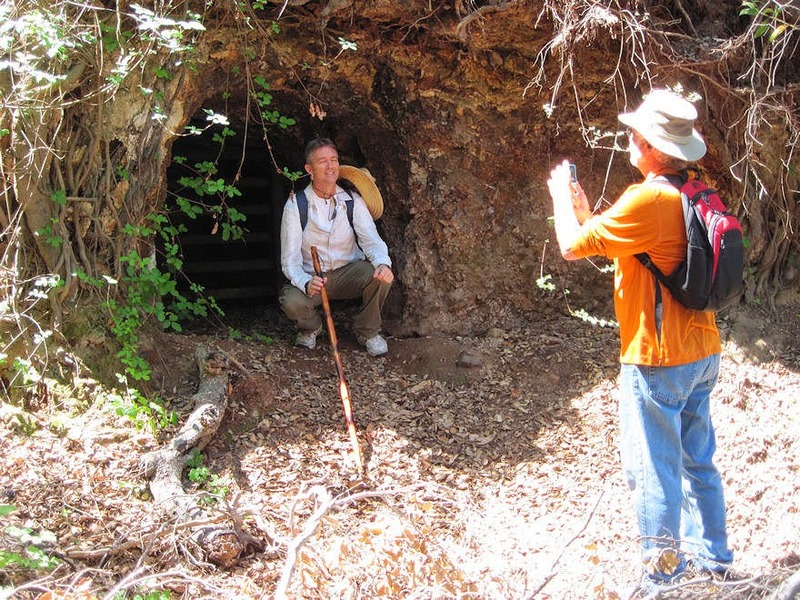 But everyone loves photos, so I'm also including a few images from the Orange County Historical Society's April 12th "History Hike" to the old Blue Light Mine in Silverado Canyon. Mike Boeck and Phil Brigandi did a great job leading the tour and interpreting the historical sites, (and we thank Karin Klein for pushing us in the right direction to begin with). I should point out that OCHS had special permission to visit the mine area, and that none of the adits are open anymore. 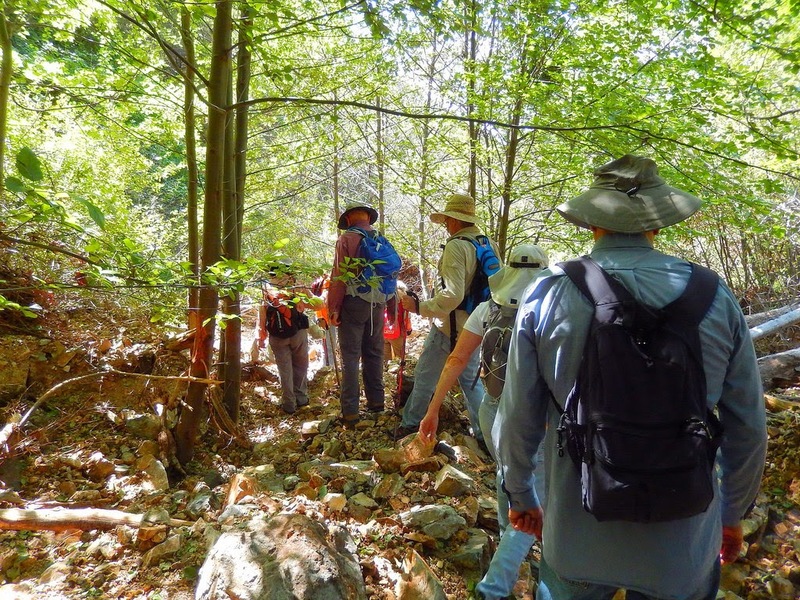 More photos from the trek are posted here. It was a fun day and a fascinating hike! 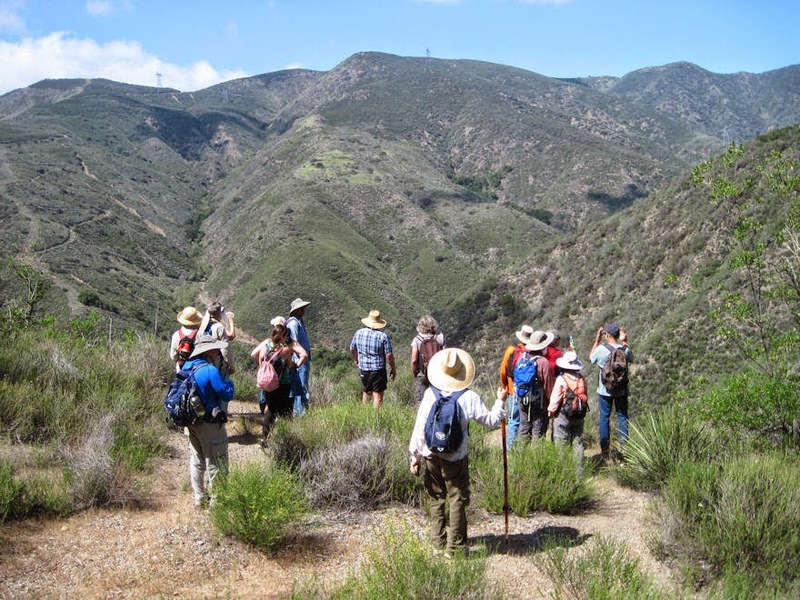 Look for another OCHS History Hike to be announced for this coming fall. Chris gives a pep talk at the trail head. Photo by Mike Boeck. First of all, if you haven't see the exhibit, "California Scene Paintings: 1920s-1970s," at the Irvine Museum, you should do so before it closes on May 8. It's great art by great artists, telling the story of California in the 20th Century. Apr. 27 - Eric Lynxwiler will present "The Birth of Knott's Berry Farm: An Illustrated Presentation" at the historic Egyptian Theatre in Hollywood, at 1pm. It will be followed by Boysenberry pie and two circa 1960 documentary shorts about Knott's: "Come and Get It" and "A Family Builds a Mountain." Tickets at Fandango.com. May 3 - This weekend will be packed full of events! 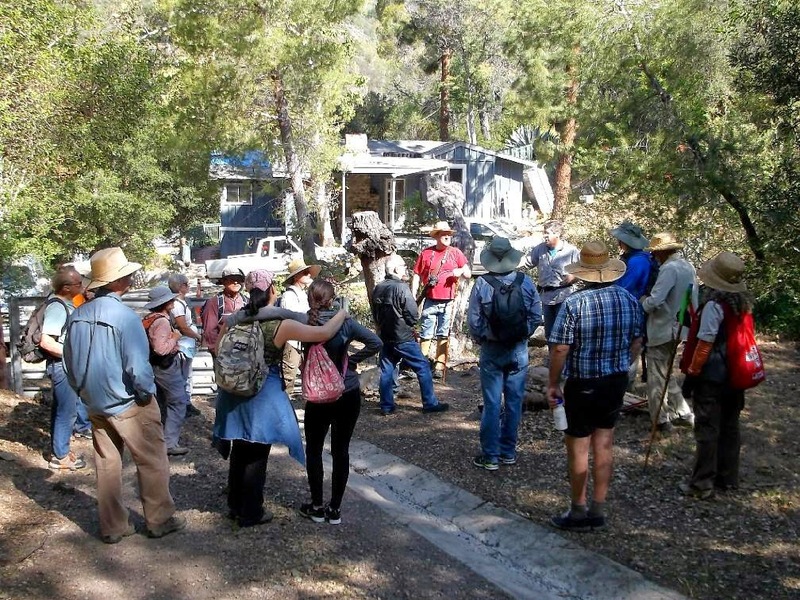 On Saturday, check out the Costa Mesa Historical Society's "Early California Days" at the Estancia Adobe, or spend the day at the Tustin Area Historical Society's 18th Annual Home & Garden Tour in Old Town Tustin. May 4 - On Sunday, take the family to the Rancho Days Fiesta, 10am-3pm at Heritage Hill Historical Park in El Toro, a.k.a. Lake Forest. There'll be ropin' and ridin' and all kinds o' old-timey music and dancin' along with crafts, historical tours, and other educational opportunities. I'll be there, tending the O.C. Archives' booth and giving away free wooly mammoths. (Just checking to make sure you were reading.) This is also the last weekend of the Ramona Pageant in Hemet, so this is clearly the weekend to overdose on "the romance of the ranchos." Olé! May 3 & 4 - Railroad Days will be held at the Fullerton Train Station, 9am-5pm on both Saturday and Sunday. The BNSF Railway will let you clamber around a modern locomotive cab, and Disneyland's Ernest S. Marsh locomotive and Kalamazoo handcar will be on hand, along with countless other rail-related exhibits, displays and activities. This event is sponsored by the Southern California Railway Plaza Association. Hiking through the woods. Photo by Charles Beal. May 6 - I'll be speaking on "Tiki and Polynesian Pop in Orange County" (similar to a talk I gave in 2010) at the Garden Grove Historical Society, 7pm, at the historic Stanley House at 12174 Euclid St. Once again, Hawaiian attire is welcomed, but not mandatory. May 10 - Santa Ana Fire Museum will hold an open house, noon to 4pm. See my review of their grand opening here. May 16 - The Orange County Historical Society will sell local history books (and sign up new members) at the Main Street Car Show in Garden Grove, 4-8pm. May 17 - The Orange County Archives will be open to the public for Saturday hours, 10am to 3pm. (Other Saturdays in 2014 on which the Archives will be open include June 21, July 26, Aug. 30, Sept. 20, Oct. 18, Nov. 15, and Dec. 13.) Across the street, at the Howe-Waffle House, on May 17, the Santa Ana Historical Preservation Society will hold an open house and Edgar Allen Poe/Edward Gorey event. May 17 & 18 - Hal Lutskey's Vintage Postcard & Paper Show will return to the Glendale Civic Auditorium, Sat. 10am-5pm, and Sun.10am-4pm. It's worth the drive. Overview of Silverado Canyon. Photo by Phil Brigandi. May 25 - Histo-tainment guru Charles Phoenix will give another of his "Anaheimland" A/V spectacles at Loara Elementary School, Anaheim, at 2pm. Tickets available at charlesphoenix.com. May 31 - The Anaheim Citrus Packing House gourmet food mall will finally have its grand opening. As a big fan of adaptive reuse, I look forward to see what's been done. And like everyone else, I'm tired of just peering in the windows. Bring on the food! June 7 - The 125th birthday of the historic Howe-Waffle House and the 40th anniversary of the Santa Ana Historical Preservation Society will be celebrated at a special open house, noon to 4pm, 120 Civic Center Dr. West, in Santa Ana. June 7 - The Sugar Beet Festival is a community shin-dig for West O.C. and East Long Beach that sneaks in a local history focus. Local history groups can register to get a free spot for a booth at the festival. Surprisingly, the Sugar Beet Festival will be held not in the old sugar hub of Los Alamitos but at The Shops at Rossmoor. 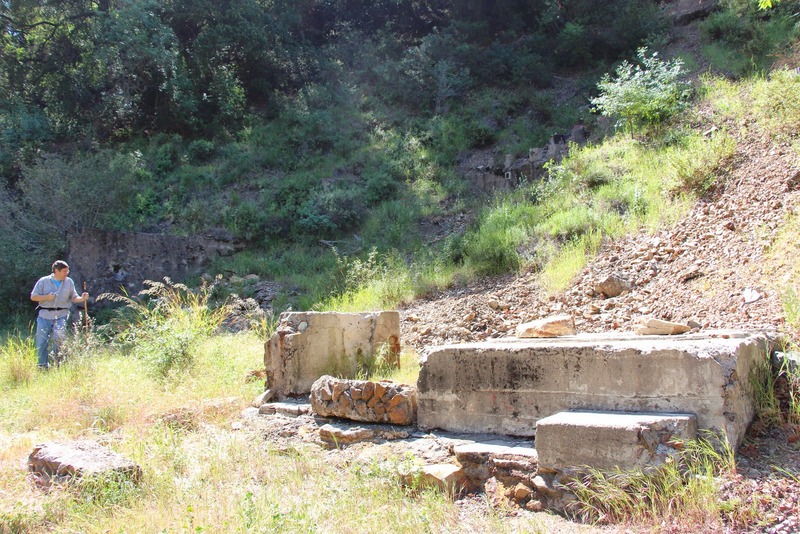 Phil Brigandi at the Blue Light Mine's stamp mill site. Photo by C. Jepsen. I don't think the free mammoth will fit in my car. Do I need a special permit to walk him home? Hi Chris -- Thanks for the plug on the Sugar Beet festival on June 7. Re: your comment that "Surprisingly" the event is not in the sugar beet hub of Los Alamitos but at the Shops at Rossmoor... we simply outgrew that site in just our first year. But not to worry... we covered our bases. The Shops at Rossmoor is located 1½ miles south of the old factory site on the old Watte Farm (leased from Fred H. Bixby) where they grew sugar beets for years... as well as lima beans, barley and alfalfa. But pretty much anywhere would have been a safe move on our part since from 1900 to 1916 sugar beets were the main crop for the entire area roughly bounded by the 710, the 5 and 405 freeways. That's why there were five factories in OC. My grandfather, Claude Dallas Wright, Sr., retired from the SA factory in 1968. I have many fond memories of holding my breath past that cloud over the freeway while riding in the back seat of my mother 66 Impala on the way to the beach.